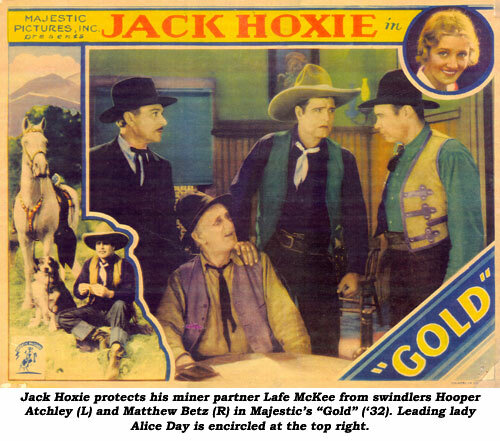 Jack Hoxie’s series of six for Majestic marked the end of a screen career that began in 1910, hitting a high from 1923-1927 when he was one of Universal’s top range riders. Following a “difference of opinion” with Universal head Carl Laemmle over a new contract, Hoxie reportedly tore up the document and walked out. He immediately signed to do a silent serial at Mascot but was otherwise off the screen touring with circuses til producer Henry Goldstone signed him for 6 at Majestic. Majestic’s non-western product had a polished look, far better than most independents of the time, but the big, beefy, awkward, semi-illiterate Hoxie represented an antiquated form of screen presence. Time had passed him by. Oliver Drake’s scripts didn’t help, often making Jack appear as a country bumpkin. After these six (far from) Majestics, Jack left the screen behind, trading on past glories on the sawdust trail til 1959 when he settled down as a rancher in Oklahoma. 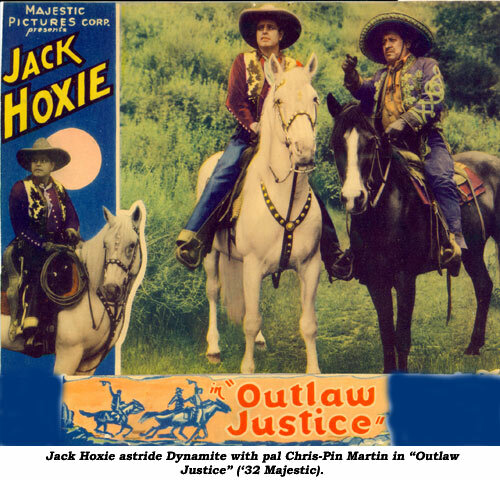 ZERO OUTLAW JUSTICE (‘32 Majestic) Outlaw Panamint Jack Hoxie and his wonder horse Dynamite, who single hoofedly steals the show, save the ranch for Dorothy Gulliver and her wayward brother from a saloon slicker and his gang headed up by Charlie King. Jack Kirk and his boys sing a song or two. 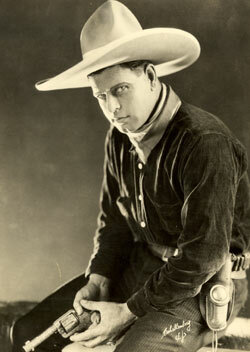 Trivia: Dynamite, the horse Jack used in talkies, is actually Scout, his silent screen horse using an alias. GOLD (‘32 Majestic) The lumbering, aw-shucks boyish charm of Hoxie is about all “Gold” has to offer. It seems to drag on twice as long as it should while crooks buy out gold claims from miners then rob and kill the miners to get their money back, thus both owning the claim and having the cash. 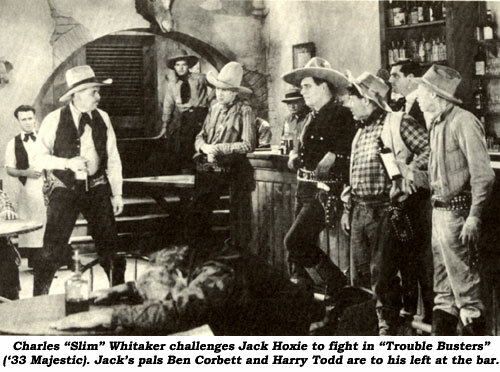 But the thieves don’t reckon on Hoxie’s resolve when they swindle his partner out of his half of he and Jack’s claim. 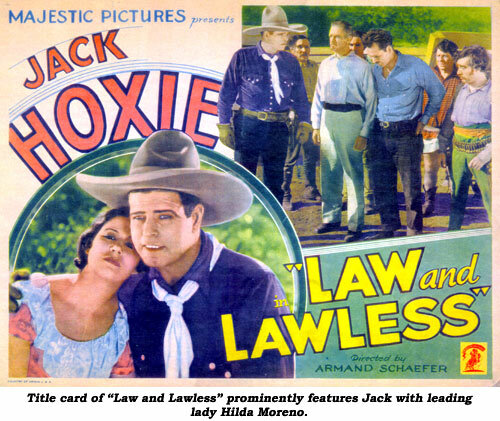 LAW AND LAWLESS (‘32 Majestic) A showcase for Hoxie’s trick riding and shooting skills as he plays a two-gun man who, with his braggadocio Mexican pal Julian Rivero, hires out to rancher Jack Mower and his pretty daughter to stop cattle rustling by mysterious night riders who shoot flaming arrows and use a chilling wolf-cry as their signal. Dixie Starr, Hoxie’s wife of 10 years as of 1930, has a miniscule bit part. 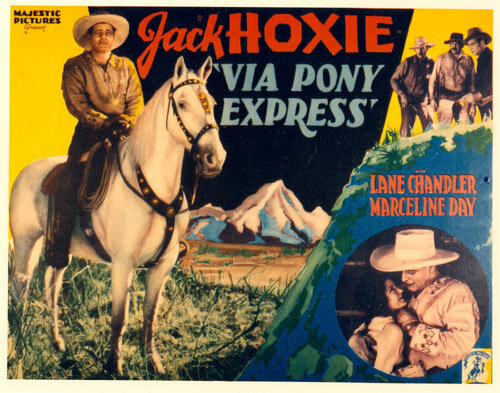 VIA PONY EXPRESS (‘33 Majestic) Jack’s horse is Dynamite—and it would take a keg of it to get this mess moving as Jack and cavalry captain Lane Chandler fight to restore Marceline Day’s Spanish Land Grants. The tedium hits a high midway with a fiesta song by a “gay” caballero. Director Lew Collins gets the blame for the boredom. 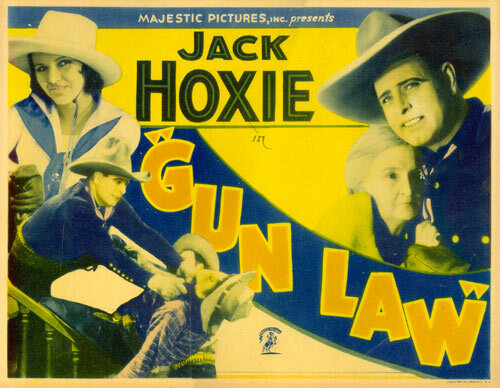 GUN LAW (‘33) Majestic) When outlaw Paul Fix is killed, his pal Jack takes his place with Fix’s nearly blind mother (Mary Carr) whom Fix hasn’t seen in years. Hoxie helps her rout rustler J. Frank Glendon, an old enemy of Hoxie’s. Jack Kirk is the briefly dubbed “singing voice” for Hoxie. Remade as “Cyclone Ranger” in ‘35, “Melody of the Plains” in ‘37, “Bullet Code” in ‘40 and “Gauchos of El Dorado” in ‘41. The story got around. TROUBLE BUSTERS (‘33 Majestic) Jack gets the horse laff when he and his friends try to run skinflint storekeeper William T. Burt out of town by throwing a scare into him, mistaking his niece, Kaye Edward, for Burt. Smitten by the girl, Hoxie rides for Placerville where he believes her to be and runs smack into two “trouble busters”, Ben Corbett and Harry Todd. Making friends, the trio arrives in Placerville where Hoxie inadvertently hires out to crooked Slim Whitaker to grab off some property while, unbeknownst to him, Corbett and Todd hire out to Lane Chandler to protect the same property—which turns out to be owned by Burt and niece Edward! The silly contrivances actually play very well with lots of fun generated. Remade as “Death Rides the Range” with Ken Maynard in ‘40.